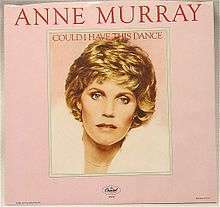 (1980) "Could I Have This Dance"
(1980) "Blessed Are the Believers"
"Could I Have This Dance" is a song recorded by Canadian country music artist Anne Murray. "Could I Have This Dance" was featured in the 1980 film Urban Cowboy and appeared on both the soundtrack album for that film, as well as on Murray's Greatest Hits compilation, issued in late 1980. It was released in August 1980 and became Anne Murray's fifth number one country hit as a solo artist. The single went to number one for one week and spent a total of ten weeks on the country chart. "Could I Have This Dance" was also Anne Murray's tenth Top 40 on the U.S. pop singles chart, hit peaking at number thirty-three. The song was written by Wayland Holyfield and Bob House. ↑ Whitburn, Joel (2004). The Billboard Book Of Top 40 Country Hits: 1944-2006, Second edition. Record Research. p. 243. ↑ Whitburn, Joel (2004). The Billboard Book of Top 40 Hits: Eighth Edition. Record Research. p. 443. ↑ "Anne Murray – Chart history" Billboard Hot Country Songs for Anne Murray. ↑ "Anne Murray – Chart history" Billboard Adult Contemporary for Anne Murray. ↑ "Anne Murray – Chart history" Billboard Hot 100 for Anne Murray.